It's a Bloc party! Films from the Soviet Bloc. A jewel that deserves to see the light of day. This surrealist masterpiece directed by Jan Nemec has had limited exhibition in the US. Mostly seen at film festivals and in museums, this 63 minute film concerns two boys who escape from a train taking them to a Nazi death camp. As they run through dense, rugged and unfamiliar terrain, their escape is interpolated with their dreams, hallucinations, fantasies, and memories. 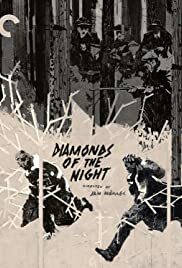 Like Forbidden Games, Fires on the Plains, and Grand Illusion, Diamonds of the Night is an anti-war film that does not deal with actual warfare. With a minimum of dialog, the film conveys the boys' physical and psychological deterioration with a maximum of cinematic bravura. This sadly neglected film deserves a Criterion DVD release.